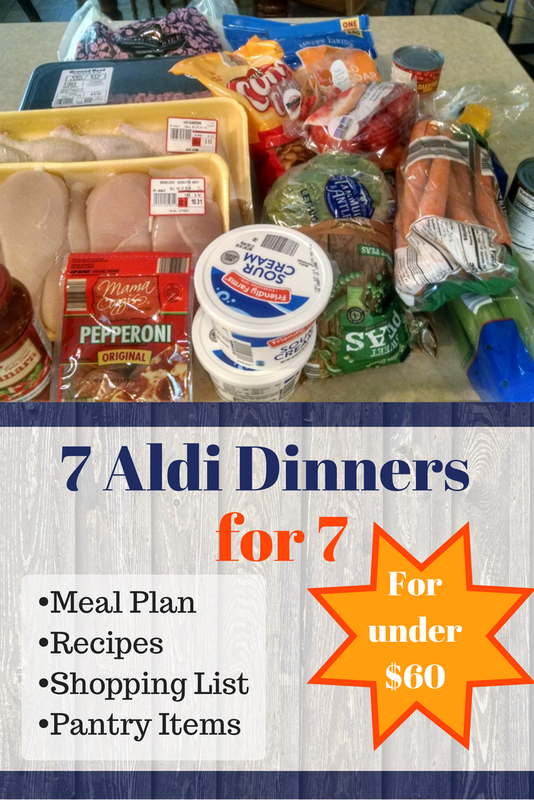 Here’s and Aldi meal plan including seven Aldi dinners recipes for a large family. We have seven in our family including three teens and one tween (and a toddler) so we go through a lot of food. If you have all young kids, you might be able to feed more. I realized again lately how not typical our family is. I was using a recipe app and trying to meal plan for our family of seven. The first problem I encountered was that it wouldn’t let me choose more than four servings for the recipes. Then when I tried adding eight different meals in one week, I got a concerned pop-up asking if I was sure I wanted to try cooking that many meals in one week. It suggested trying to make 2-4 instead. Well, my husband, four boys, and my little girl are home at almost every meal, so yes, we do need something to eat every meal. We do have our quick meals (tuna sandwiches, re-fried beans quesadillas, left-overs, etc. ), but I like to have a number of meals on hand to make. The total for the groceries should come in just under $60. You might notice that my receipt came in just over $51. I already had cabbage and potatoes from my Mom’s garden and I have plenty of canned salsa from a surplus in garden veggies last year. However, I did buy a big bag of Jasmine rice. Usually we buy brown rice in bulk elsewhere, but we were out right now and my boys think white rice is a treat so I went with it. I also added in a package of chicken leg quarters at 3.92 that isn’t on my receipt. The grocery list you can print includes the extra ingredients and a 3lb bag of white rice. Preparation: Fry hamburger when you get home and divide into three quart bags and freeze. Homemade Pizza Dough: I use a recipe similar to this homemade Neapolitan-style dough. Be forewarned, it requires a very long rising time, but that’s what makes it good. I mix it up in my bread machine, but you could use a stand mixer. I make one large cookie sheet and one round pizza pan with it. Use the jar of spaghetti sauce (you could also buy pizza sauce, but for some reason I always buy spaghetti sauce and use the left-over later in spaghetti), package of pepperoni, and bag of mozzarella cheese. You could also add peppers and onions since you are going to have extra. Mix one bag of hamburger with chili beans. Serve on top of cooked potatoes with salsa, cheese, sour cream, ranch dressing, and/or butter. Mix one bag of ground beef with black beans. Add 1 tsp salt, 2 T. chili powder, and one tsp. garlic. You could also add 1/2 tsp. cumin. Serve with rice (we use 4 cups prepared rice), lettuce, tomatoes, salsa, sour cream, and corn chips. Use up to half of package of chicken breast. Technically you only need 1 1/2 lbs for this recipe, so you could double the recipe and stick the extra meal in the freezer. So there’s a bonus meal for you. Use the remaining chicken for the recipe following this one. I don’t usually use a specific recipe for this, but this Homemade Chicken Pot Pie recipe is pretty close. I would cook carrots, celery, and diced onions (instead of frozen pearl onions) in the chicken broth instead of draining off the cooking liquid and losing vitamins in the process. Minced chives, parsley, and thyme are optional if you don’t have them. Also milk or half-and-half could be used instead of heavy cream. I also use chicken soup base to make the broth instead of buying broth. I’ve been foregoing the crust, and topping them with these Red Lobster Cheddar Bay Biscuits. You can easily double the recipe and freeze half of them for a side dish later. (Drop on a cookie sheet. When frozen put in a plastic bag. Bake in preheated 475 oven for 5 minutes. Reduce heat to 425 and bake for 10 minutes.) I included cheese for double this recipe, but if you just go with pie crust, use the cheese on the Chili-topped potatoes. Use the rest of the package of chicken breast. Use this Creamy Curried Chicken and Rice Casserole. I would use slightly more oil, more chicken, and use full fat milk or half-and-half. I don’t usually add cilantro, but if I had it, I definitely would. You could also make a little more saucy and serve over rice instead of mixing the rice into the sauce. Use this recipe and serve over rice. I just use cabbage, carrots, and onion. I also use ground beef for this instead of sausage. Use the chicken thighs with this Chicken Marinade. As one of the reviewers stated, anyone from Upstate New York knows that this is the best marinade around. Marinade the chicken leg quarters overnight in this. Serve with oven baked fries and coleslaw. I was disappointed that I couldn’t get the grill to start when I was making this, but I baked it in the oven and it came out so moist and flavorful. And here’s a printable shopping list. Click on the image for a printable PDF. 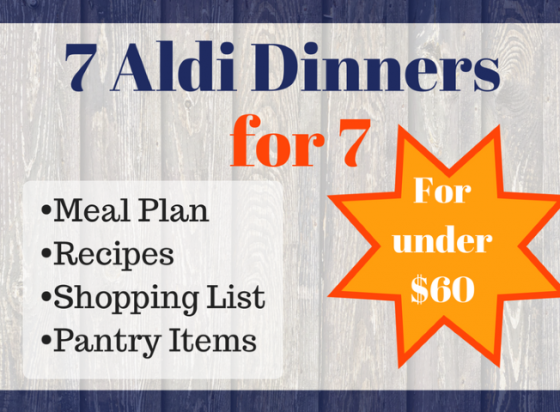 I had a lot of fun using my new Aldi Master Price List and Shopping List Generator to come up with this meal plan. If you like planning and budgeting, you’ll love this new tool for planning meals.